Poultry production is one of the fastest growing agricultural activities in Egypt. This activity is delivering large quantities of chicken manure. This organic waste can have a negative impact on the environment and public health in the vicinity of the Egyptian agricultural farms. In this study, we treated this organic waste by anaerobic digestion for achieving the maximum production of biogas with a high percentage of methane. For this, we investigated the different ratio of bacterial inoculum and manure chicken content. Seven anaerobic mixtures with different inoculums (1:1, 1:2, 1:3, 1:4, 1:5, 1:6 and 1:7) were tested. All digesters are placed in a constant temperature 35 °C. 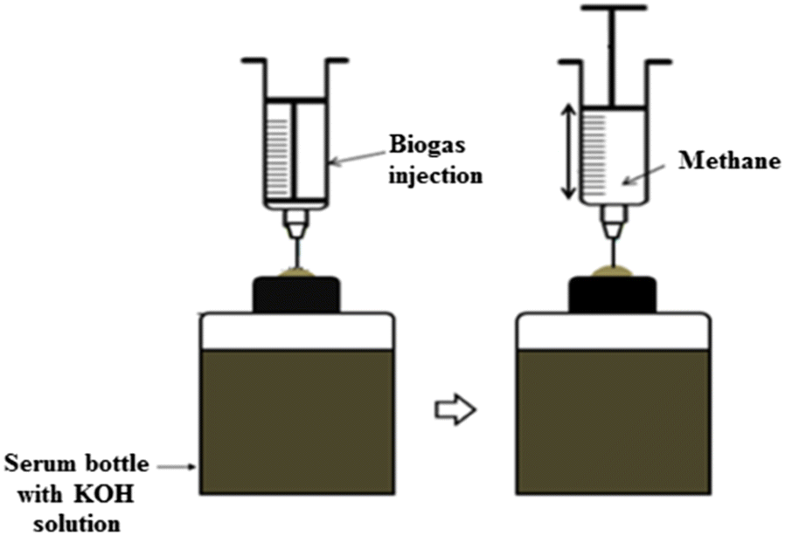 Biogas and methane production during 50 days of incubation. The best ratio in terms of biogas produce is the low ratio (1:7) with a production of 73.3 Nml/gVS. But from a qualitative point of view, the largest ratio (1:1) was delivering a biogas with the highest calorific value in terms of methane content with 69.9% of biogas. The energy valorization of chicken manure depends on the waste/inoculum ratio. The maximum biogas produced is using the lowest ratio of waste and inoculum (1:7) but the highest methane percentage in the biogas is reached by the highest of ratio (1:1). Thus, from a qualitative point of view, the high percentage of methane is obtained for the highest ratio 1:1, however, from a quantitative point of view, the largest production is obtained from the lowest ratio 1:7. Poultry production has been one of the fastest growing agricultural activities in Egypt. The poultry sector employment represents approximately 6% of Egypt’s 23.7 million labor force in 2003 and more than 15% of the agricultural work force . In 2014, this country has produced 140 millions chicken heads . The growth of this Egyptian activity leads to increasing quantities of chicken manure in farms and breeding units. Therefore, this large production of chicken meat produces large quantities of organic wastes. This waste must be strictly managed according to the governmental regulations because it delivers high content of nitrogen and pathogenic bacteria, mainly staphylococci and enterobacteriaceae [3, 4]. These quantities of bacteria and nitrogen can be lost through lixiviation or runoff and will be retrieved in groundwater and surface water, causing diseases or epidemics [5, 6]. It is involved too in the production of greenhouse gas, with the big emission factor (0.023 kg head−1 year−1) . Thus, the chicken manure has a negative impact on the environment and public health. In other hand, Egypt was exposed to repeated electricity failures because of a combination of increasing demand, natural gas supply shortages, old infrastructure, insufficient generation and transport infrastructure. In addition to that, this country has become dependent on hydrocarbon imports. Consequently, this energy deficit has a negative impact on economical trade balance and the country budget . In front of these two problems, the progressive production of chicken’s manure and the energy deficit is an ideal situation to develop a green technology that combines valorization of waste and production of energy. Among the current technologies, anaerobic digestion is gaining more importance across the world, thanks to its efficiency as a green treatment . This process is based on the degradation of various organic wastes and substrates in hermetically closed digester [10, 11]. These organic wastes are partially converted by microorganisms to biogas [12, 13]. Biogas is a renewable alternative fuel for internal combustion engines that has several advantages over conventional fuels, including lower costs, reduced levels of harmful emissions and being carbon neutral . Thus, the biogas is delivering energy by cogeneration motor able to supply the farms and the breeding units in green energy . In this work, we treated this Egyptian organic waste by anaerobic digestion. Precisely, we have studied the different ratios of waste and inoculum for producing the ideal quantity of biogas favoring a large high calorific value. This study is the first attempt to study the ratio of waste and inoculum in the Egyptian area. Chicken manure contains manure droppings and bedding material. Taken from a commercial poultry farm housing with 6000 broilers per cycle, with an annual manure production 14 tons at Sharqia governorate in Egypt. This organic waste is collected in a 20-l plastic bucket with tight lids, and immediately stored in a freezer at − 20 °C in the laboratory. The inoculum used in this work is obtained after 50 days of anaerobic digestion of cattle manure at mesophilic condition (35 °C) in our laboratory. All the organic matters in this inoculum are exhausted and the bacteria are very activated . The compositions of chicken manure and inoculum are summarized in Table 1. 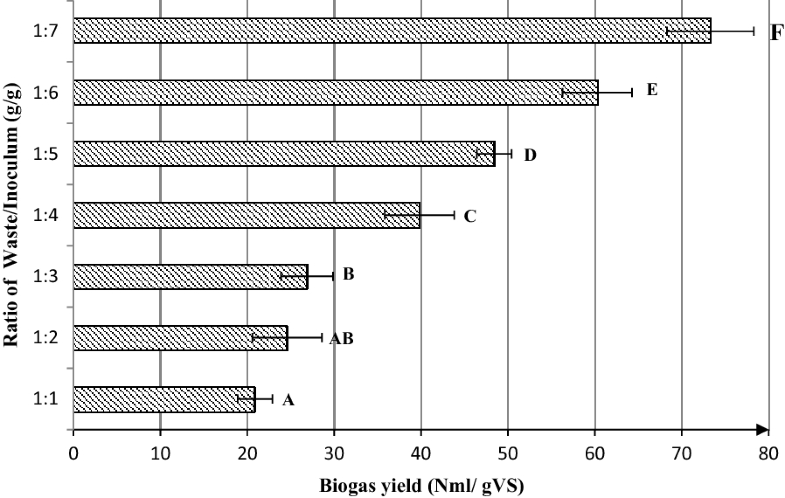 In this work, eight anaerobic digestion tests were conducted: 1 control (inoculum only) and 7 experimental (waste with different quantity of inoculum). These tests are based on completely randomized design. The use of a control test allowed us to set up the deduction of the amount of biogas production by the residual organic matter in the inoculum alone. The experimental tests have included the combination of seven different ratios (1:1, 1:2, 1:3, 1:4, 1:5, 1:6 and 1:7) of poultry manure and inoculum, respectively, without dilution with water (Table 2). The tests were prepared with a balance to allow the mass balance by grams, and we assumed an inoculum density of 1 . Consequently, each experimental test had different C/N ratio ranged from 16 to 17.5 and a total solid content ranged from 14 to 32%. Each test was replicated twice. The eight types of digesters used in this work are conical flasks of 500 ml. 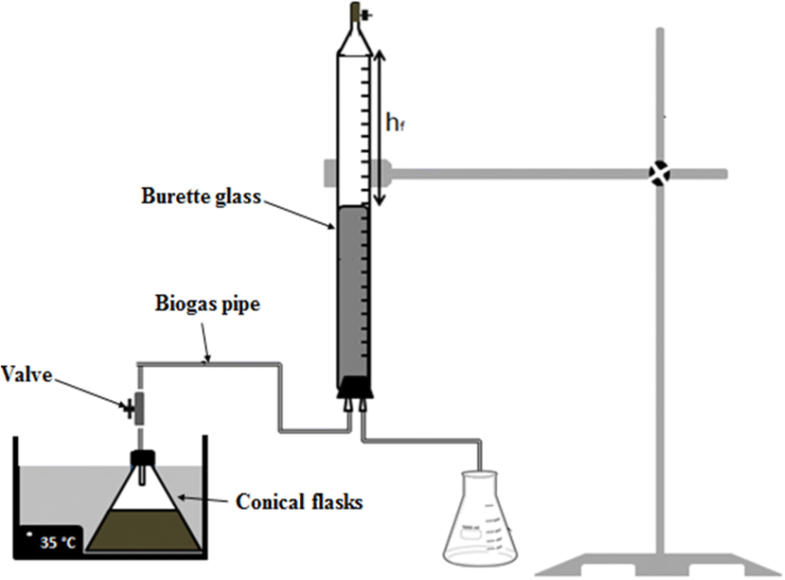 Each digester was sealed with a rubber stopper and connected via its biogas outlet to a 100-ml burette glass collecting apparatus (Fig. 1). The fabricated biogas collecting device has a valve which was used to run-off the process. All digesters are placed in automatically controlled temperature water bath, with a constant temperature of 35 °C. The agitation of these digesters is manually performed for 30 s only once a day for two reasons, (i) to achieve a contact between the microorganisms and waste, and (ii) to prevent scum formation. The dry anaerobic digestion is performed during 50 days per batch mode. Every day, we followed the biogas production by moving acidified saline water in a graduated and an inverted burette connected to the digester . The volumes of biogas produced were adjusted to the standard conditions of pressure and temperature . The content of methane (CH4) in biogas product was determined as follows. A known volume of the biogas produced (V1) in a digester was syringed out and injected into serum bottle which contained 20 g l−1 of KOH solution (Fig. 2). This serum bottle was shaken manually for 3–4 min so that all the CO2 and H2S was absorbed by KOH solution . The volume of the remaining biogas (V2) which was 99.9% CH4 in the serum bottle was determined by means of a syringe. 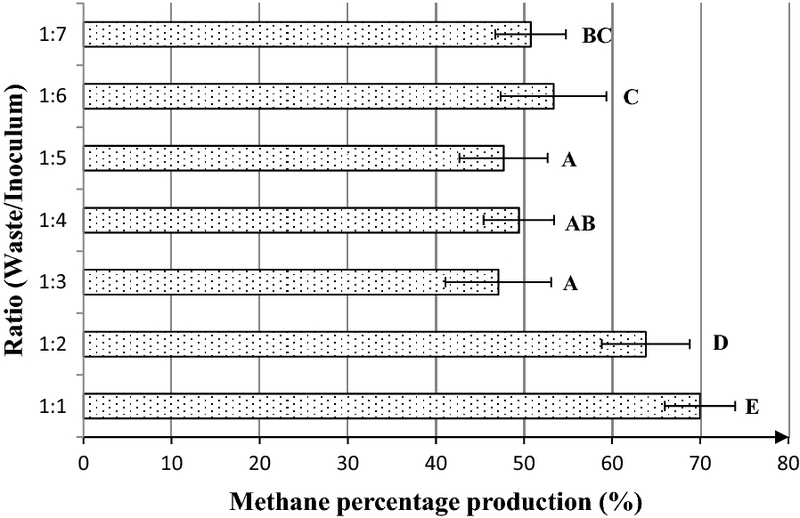 The percentage of the report (V2/V1) provided the content of CH4 in this biogas production . Total solids (TS) and volatile solids (VS) are considered as the most important qualitative and quantitative criteria for an organic waste treated by anaerobic digestion. The TS was performed according to the standard protocol which consists of drying the fresh matter (FM) at 105 °C to a constant weight. The VS is a gravimetric method based on the mass loss of the dry sample (sample from the determination of TS) in a muffle furnace at 550 °C for 6 h .
We measured the pH in digesters with a pH meter (WTW 720 handheld pH meter, Germany), which was calibrated by both standards (pH = 4 and pH = 7). The pH was determined two times: The start of tests (pHi) to verify the beginning of the anaerobic digestion and at the end of tests (pHf), i.e., after the 50 days period of anaerobic digestion. All data collected of this work were subjected to statistical analysis using Statistical Package for the Social Sciences (SPSS). We started these analyses with the Levene test to determine the homogeneity of the variance (Homoscedasticity). Then, we performed one-way analysis of variance (ANOVA) to determine the significant differences for the different parameters (biogas, methane yield and pH). Moreover, the Duncan’s multiple range tests were used to establish which ratio is significantly important. Table 3 illustrates the analysis of variance of methane production, biogas yield and pH. The variances are homogeneous (verified by the Levene test). Thus, we opt for the ANOVA test. This last test shows that the p values are all less than 0.001 (p < 0.001), which allows us to conclude that the differences observed at the level of methane production, the biogas yield and the fluctuation of the pH are statistically significant. After 50 days of incubation, we observed that all ratios of waste and inoculum did produce biogas. The lowest among these ratios (1:7) is the most important ratio in terms of the quantitative amount of biogas produced 73.3 Nml/gVS compared to other ratios (Fig. 3). As well as the comparison of means by Duncan test showed that there has a significant increase in quantity of biogas in the ratio (1:7). We also note that the largest C/N ratio (17.76) belongs to this ratio (1:7). Therefore, this biogas is correlated with an excellent C/N ratio. Thus, the latter provides an excellent supply of carbon and nitrogen for the bacterial arsenal . The increase of the waste and inoculum ratio (1:1) leads to two types of inhibition: The first type is by production of ammonia because the introduction of a large amount of nitrogenous substrate in the digester. Abouelenien et al. (2010) confirmed that this ratio of chicken manure and inoculum (1:1) produces a large fraction of ammonium causing a low production of biogas . This ammonia (NH4+) product at a deamination during digestion anaerobic, it is able to diffuse passively into the inoculum bacteria mainly the methanogens thanks to its hydrophobic character, creating a proton imbalance , leading to a loss of potassium  and blocking enzymatic reactions . The second type due to the accumulation of volatile fatty acids (VFAs) resulting from the biodegradation anaerobic of this waste. This is because of the transport and transformation’s mechanisms from liquid phase to solid and biological degradation of VFAs is becoming difficult [24, 25]. Hwu et al. recommended that the transportation limitations were causing sludge floatation resulting from adsorption of the long chain of fatty acids into cell walls. Finally, the percentage of waste having access to the cells of inoculum has restricted the production of biogas . On the other hand, this low ration (1:7) contains a small fraction in TS (14.78%) which leads to a low approval in organic matter and nitrogen (Table 2). Thus, this ratio does not exhibit inhibition by ammonium or volatile fatty acids. 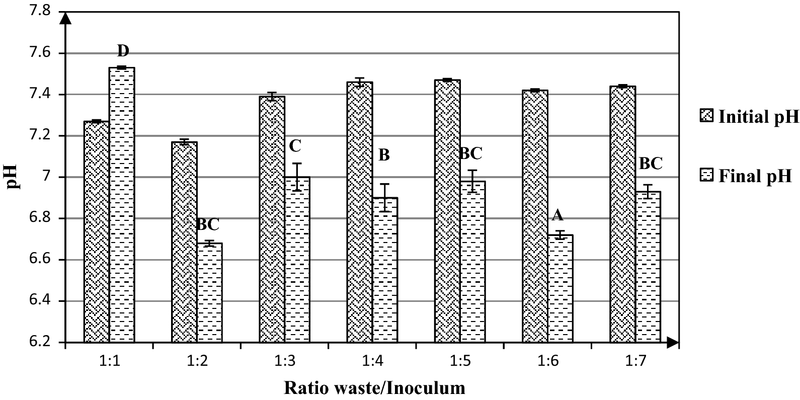 The lower ratio of waste and inoculum indicates also a lower quantity of ammonia and VFAs within the microorganism present in digester. Thus, the existence of a higher inoculum quantity than organic waste dedicated to the valorisation by anaerobic digestion may dilute the ammonia and VFAs [24–31]. This low ratio also indicated a higher adaptation of microorganism to the substrate content resulting in a higher biogas yield . Some researchers states that this low biogas production may be due to imbalances of hydrolytic, fermentative, and acetogenic bacteria, and methanogenic archaea . Generally, these imbalances are caused by improper C/N ratio, accumulation of VFAs, and high content of total ammonia–nitrogen and free ammonia concentration [34, 35]. Finally, the 1:7 ratio is the optimal ratio for the production of biogas from chicken droppings. On the other hand, the important inoculum load reduces the risk for the installation of inhibition. These results are similar to work such as Neves at 2004, which confirmed that the low ratio is better for anaerobic digestion of other organic waste and substrate . The comparison of means by Duncan test showed that the ratio (1:1) has a significant content of methane in biogas produced. Thus, we noted that the high ratio (1:1) has the highest methane content (69.9%) compared with the other ratio studied (Fig. 4). Therefore, the ratio 1:1 is the most important qualitative ratio because it produces a biogas with a large high calorific value of order (6.9 kWh/m3). We have already noticed that this large ratio is producing the lowest production of biogas but with an excellent quality. This big production of methane in low biogas production is indicated by the occurrence of few survivals of the anaerobic consortium that are able to digest the accumulated long chain of fatty acids and to reproduce the methane . Nazaitulshila  described the same result, by studying the fat and oils where the increase in the ratio to 1:1 makes it possible and has recorded a large percentage of methane. The other researcher such as Chynoweth  reported that a maximal methane yields were obtained with ratio of waste and inoculum between 1:2 and 1:1 in anaerobic batch digestion of herbaceous, woody feedstock and municipal wastes . Based on a volatile solid, Li et al. 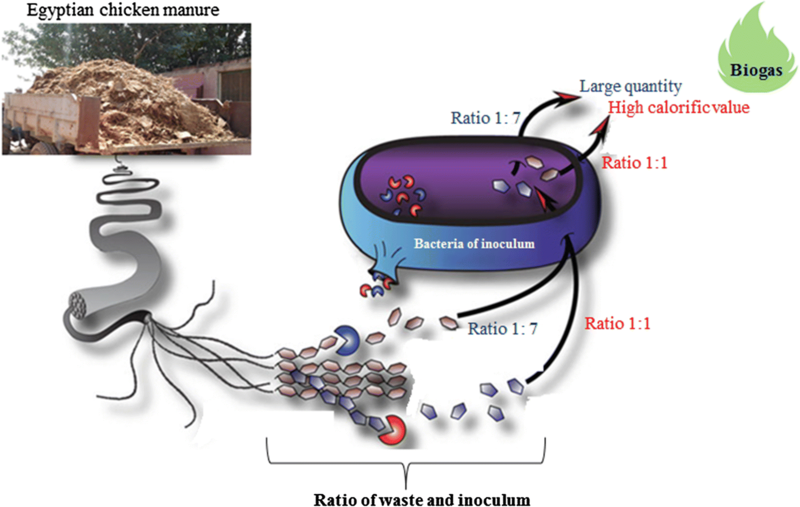 have demonstrated that higher cumulative methane production was observed for the 1:1 ratio of waste and inoculum, when kitchen waste was used as a substrate. Finally, the high ratio of waste and inoculum (1:1) influences methane yields for this organic waste. We observed that all the ratios in this work showed a decrease of the pH level at the end of the anaerobic digestion except for the high ratio (1:1) which showed a pH increase (Fig. 5). The decrease of pH in the ratios (1:2–1:7) is due to the production of organic metabolites in four steps of anaerobic digestion of this waste . On the other hand, the increase of pH in the ratio 1:1 is due to ammonia–nitrogen (NH3–N) concentration could contribute to the alkalinity and could help to maintain the pH value . But the excess of ammonium can inhibit the destruction of organic compounds, the production of volatile fatty acids and methanogenesis activities . Therefore, this result explains the low production of biogas by the high ratio (1:1). The ratio 1:7 shows a slight decrease in pH from 7 to 6.93 but this low fall remains in the optimal interval of the biogas production . Finally, the treatment of chicken manure is done according to the intended use, if we want a large production of biogas with a low-calorific value is used the ratio 1:7 but if we need a biogas of small quantity and with a large calorific value we used the large 1:1 ratio. The treatment of Egyptian manure chicken by anaerobic digestion is feasible and positively recommended. The use of an optimum waste/inoculum ratio is essential for the best energetic valorization of this type of organic waste because the ratio of waste/inoculum is impacting the biogas and methane production. The maximum biogas volume produced is using the lowest ratio of waste and inoculum (1:7) but the highest methane percentage in the biogas is reached by the highest ratio (1:1). Therefore, from a qualitative point of view, the high percentage of methane is obtained for the highest ratio 1:1; however, from a quantitative point of view, the largest production is obtained from the lowest ratio 1:7. The lesson learnt is that the ratio waste/inoculum was clearly the most important parameters for the treatment of chicken manure and the related production of green energy in Egyptian agricultural farms. OE, MS designed the experiments; MS performed the experiments; OE, MS, MR, OZ and LL wrote this manuscript. All authors read and approved the final manuscript. We deeply thank Mrs Hicham Elasri and A. Fauzi Taybi for their technical support to produce this work. All data generated and analyzed during this study are included in this manuscript. All authors have approved to submit this work to Chemical and Biological Technologies in Agriculture. They declare that there is no conflict of interest in relation to the submission of the article. FAOSTAT, Food and Agriculture Organization of the United Nations. Statistics division, live animals, Egypt, Stocks, Chickens. http://www.fao.org/faostat/en/#data/QA. Accessed 30 July 2018.